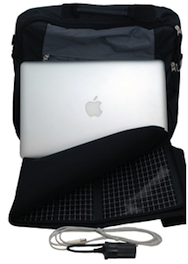 If your idea of mobile computing includes going places where there are no wall outlets, QuickerTek can keep your MacBook charged with its Apple Juicz line of solar power chargers, now upgraded for use with the new MacBook Airs. The Apple Juicz is a flexible photoelectric tarp which can be laid out upon or staked to the ground to absorb sunlight. The 27-watt model covers 41.5 by 30.5 inches, and recharges a MacBook Air in 12 hours; the 55-watt version is 59 by 43 inches, and does the same in six hours. Both fold up to notepad size for transportation in an included case. The Apple Juicz comes with a rebuilt MagSafe connector for use with your MacBook, a 12V car charger, and a third connector to attach other QuickerTek products such as external battery packs. QuickerTek offers to add additional connectors for your other devices upon request. Their Website lists the Apple Juicz for the MacBook Air as a separate unit from the standard model, but also says their standard model is compatible with the Air; check with QuickerTek if you plan on mixing and matching your MacBooks. Apple Juicz costs $700 for the 27-watt model, and $1200 for the 55-watt model.